"Light the doobie 'till it glow like a ruby"
The Bends is ranked 4th best out of 20 albums by Radiohead on BestEverAlbums.com. The best album by Radiohead is OK Computer which is ranked number 1 in the list of all-time albums with a total rank score of 196,766. Members who like this album also like: OK Computer by Radiohead, Kid A by Radiohead and Nevermind by Nirvana. Related links: top tracks by Radioheadtop tracks of the 1990s, top tracks of 1995. Showing latest 5 ratings for this album. | Show all 3,201 ratings for this album. Related links: top albums of the 1990s, top albums of 1995. Top Tracks: "(Nice Dream)", "Just", "Black Star"
Sounds a little dated, but somehow it makes it even more charming. The group would go on to better stuff, but this is hands down one of the peaks of 90s pop rock. Not a bad album by any stretch, but it decide really stand out from other 90s alt-rock/soft-rock music. I really like High and Dry, Sulk, and Street Spirit, but the rest were just fine. I can see me getting into Fake Plastic Trees and Planet Telex, but I don't think this comes close to In Rainbows nor OK Computer. Well, what a jump i might say, from Pablo Honey to this, who would know that Radiohead would become the next greatest thing since the Beatles? For me, The Bends was my welcome-album to Radiohead, I was a guitar guy and this album really digged me up, I mean, to this day, I really think Jonny Greenwood (Greatwood? Hollywood? Gillywood? Goatwood? God, i always forget his last name) is the last guitarrist to actually improve something musically about his instrument, coming up with new ideas on how to use it, and eventually coming with even stranger stuff in Kid A. It used to be my favorite Radiohead album, but as time went on and I listened to their other stuff It slowly but surely went down my list a little bit. I wish i was the guy that doesn't have an idea why, but i certainly have: "Killer Cars" WHY KILLER CARS IS NOT IN THIS ALBUM, IT IS THE BEST SONG BY RADIOHEAD BELIEVE ME! From Pablo Honey to this, is outstanding. Pablo Honey wasn't terrible, but it wasn't great, besides a few songs. 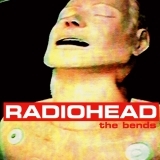 The Bends is where Radiohead truly became their own, and with this being the first album Nigel Godrich produced, Radiohead sounds more personal, raw, yet beautifully produced. It's not my favorite Radiohead album, but for me, choosing my favorite Radiohead album is like picking my favorite child, and I don't even have kids, I tricked you. "Planet Telex", the title track, "High and Dry", Fake Plastic Trees", "Just", "My Iron Lung", "Street Spirit", there's so many fantastic songs, and the rest are great as well. I cannot express my passion enough for how much I love this album, and Radiohead as a whole. It's a great start for anyone looking to get into Radiohead, and it's among their best releases. While it is a big improvement from "Pablo Honey", "The Bends" is still not up to par with what Radiohead is going to give us later. I think it's a good album, but nothing is spectacular here. I would even dare say that it gets a little boring and repetitive as we go through the songs. "High And Dry", "Fake Plastic Trees", "(Nice Dream)" and "Bullet proof... I Wish I Was" are all very similar in their tone and general feeling. I don't think we needed four songs like this, two would have been ok for me. Especially 23 years later, now that these songs may sound a little cheesy. The rest of the album sounds like an average guitar-driven 90's band. Don't get me wrong, I don't hate it, in fact I like it. It's just that I don't love it. It is not as innovative or groundbreaking as, say "In Rainbows" or "The King Of Limbs", which are my two favorite Radiohead albums. Radiohead will mark the music history as one of the greatest bands ever. But I think most of their legacy (if not all) is because of the work they've done after "The Bends".